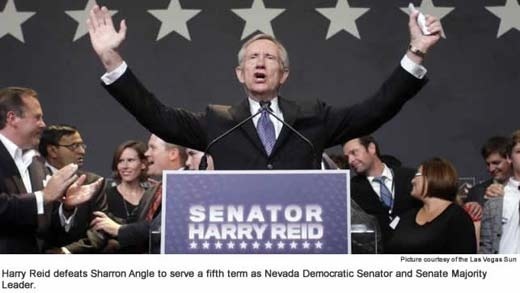 Harry Reid will sit in the Senate Majority Leader seat once again as he defeats Sharron Angle for the Nevada Senate seat on November 2nd. The long tim Nevada Senator pulled off an impressive victory as challenger Sharron Angle pursued him closely and aggressively in the poles yesterday evening. Though it came down to the wire, the long time Senate member stood tall on the victory podium. Sen. Reid's victory helped to secure the majority rule of the Democratic Party in the Senate as they lost the majority to the Republicans in Congress. Many Nevadans reported their high distain for Sharron Angle and her extreme agenda stuffed with shocking determinations to privatize the VA and eliminate social security and Medicaid. "I can't believe she was even on the ballot," said Alice Hatfield, a Las Vegas Republican who voted for Reid. "Doing away with Social Security, Medicaid, privatizing the VA — no way. Harry needs to go, but there's nobody on the ballot to replace him." Challenger Angle seemed deep in defeat before the November elections took place by failing to gain the support of influential persons in her own party. Many Republican politicians and business owners' verbalized their anti-support for the candidate well before the polls officially opened. Television ads that seemed to take over the Nevada airwaves impressively denounced Sharron Angle as the wrong choice for the Senate as she seemed to say one thing and pursue another. "As a U.S. Senator, it's not my job to create jobs," says Angle in a town hall meeting in Nevada. She goes on to say, "We want the government out of our lives"
Though her whole campaign consisted of the concept of keeping government at bay in our lives, reports say that she and her husband live off of his pension and medical insurance provided by the BLM, a government agency that owns abundant land here in the United States. The accusations hurt her chances in the Senate as her numbers seemed to drop in the approaching days of the election eventually leading to her overall defeat. Though Harry Reid stood victorious, his son, Rory Reid, fell short to New Republican Governor-Elect of Nevada, Brian Sandavol. The father son duo looked to a future of a family run state, but their dreams were quickly stomped out by the convincing win of Sandovol. "I want you to treat our new Governor with respect," says Rory during is concession speech at the Aria. Reid also goes onto say, "Governor-Elect Sandoval faces difficult challenges and he'll need us all to come to together to solve our states issues. My campaign for Governor ends tonight. My commitment to Nevada doesn't end tonight"
With the Senate still in the control of the Democrats and the Congress now in the hands of the Republicans, our political agenda has many challenges ahead. Hopes of the Senate and the congress working together stays a hopeful journey in the minds of Americans, but have little faith due to the turmoil our Nation has been in due to compromising events that occurred during the last Bush administration. Nevada saw the loss of (D) Rep. Dina Titus as a Nevada Democratic Representative in Congress and (D) Rep. Shelly Burke regained her seat to serve a second term.